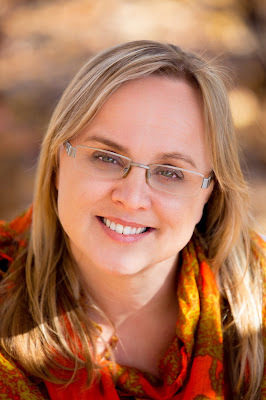 I'm excited to once again participate in a blog tour for Paula Weston's The Rephaim series! This one's a little bittersweet, because we've arrived at the fourth and final book, Burn. Continue reading for my review of this thrilling series ender! Synopsis: Suddenly, Gaby remembers everything. Review: It’s time to show one last bit of cover love for The Rephaim series, as we’ve reached the fourth and final installment, Burn. The cover of Burn reminds me of the cover for the first book, Shadows, which makes perfect sense because we see the series complete a full circle here. And what a thrilling, non-stop tidal wave of a journey it is from the first page to the last page of Burn. The previous book, Shimmer, ended with one jaw-dropping cliffhanger. After spending three books trying to piece her lost memories together while simultaneously dealing with demons from hell, protagonist Gaby now remembers everything. How she and her twin brother Jude ended up going their separate ways, what brought them together again, and how they both nearly died. All of it. Unsurprisingly, the past holds some very ugly truths for Gaby, particularly the incident leading up to Jude and the Outcasts walking out of the Sanctuary. I winced on Gaby’s behalf quite a few times. 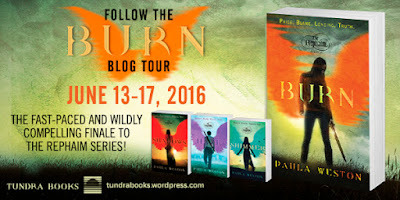 Paula Weston has done a marvelous job pacing this series from the beginning, and especially so with Burn. The novel shifts back and forth between the present and the past as the gaps in Gaby’s memory are filled in. The startling revelations just keep flowing, but they never feel like info dumping. Rather, the book compels you to continue reading because you can’t wait for the next missing fragment of Gaby’s past to drop. I inhaled Burn in three days; I don’t get to binge read books too often anymore, but this book demanded that I not leave it for too long. You know a book has wholly reeled you in when you can never find an ideal spot to place your bookmark. The ending of Burn was not at all what I’d thought it might be, and I loved how it caught me so completely by surprise. Before the series draws to a close, however, there’s plenty of its signature heart-stopping action. Hell is literally headed for Gaby’s beloved Pan Beach, and it’s going to take the collective efforts of all the Rephaim, both the Outcasts and those still loyal to the fallen angel Nathaniel, to even stand a chance of facing down the approaching horde. As bitterly divided as the two sides of the Rephaim have been, they also realize what’s at stake. Gaby herself has to come to terms with an extremely painful event in the past. She must reconcile the Gabe she once was with the Gaby she is now, and there’s nothing like impending destruction by demons to help put things in the proper perspective. There are so many things I’m going to miss about this series: Gaby and her amazing strength, Rafa and his brilliant snark (I will especially miss Rafa AND his brilliant snark), the intense, knockout action scenes, the beautiful book covers, and, of course, Weston’s wonderful prose. Although Burn provides a very satisfying conclusion to The Rephaim, it also leaves open the definite possibility of another story. In Burn, the Rephaim learn that prophecy doesn’t necessarily translate to destiny and can be altered by free will, which further raises my hopes of reading more Rephaim chronicles one day. 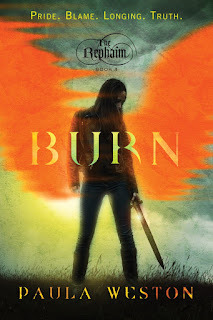 All in All: The Rephaim series closes on a high note with Burn. Readers who’ve been with the series since Shadows are well rewarded, as Gaby finally has all the missing pieces to her past. The present story line offers its own surprises as well, meaning that you’ll be riveted by Burn from start to finish. It's so rewarding when a series you follow and love closes on a high note. Speaking of, I got The Raven King today! Thank you!!!! I really enjoyed this series, and I can't believe it's over already! It feels like I just started the first book. I am so happy that this series ended on a high note for you! There's no better feeling :) Despite that, beloved series endings are always bittersweet, so sad to not get to follow our favorite characters FOR EVER! I added this series to my to-read list based on your reviews. It looks like a story that I'd fall in love with. I'm really glad it ended so strongly! I will definitely be reading this series when I can.